When the heat sets in my inner hippie comes out. I get this irresistible urge to dress in light layers, crochet, and turquoise jewelry. I've been looking for the right top to wear with this skirt for months and when Hallelu sent me this little cropped number it was the perfect match. I wore it on a delightful stroll downtown to listen to Music in the Park. looking beautiful as always, taylor! Love the easy-breezy summery look! Especially the yellow sandals, I have to say. Happy sunny weekend to you! Love that line...so true! Hippie chic to beat the heat!! Love this laid back combo...your skirt is so adorable paired with that shot of yellow! You look hot! I would love to copy this outfit! I'm obsessed with that skirt. Like completely obsessed. It's so bright and pretty! 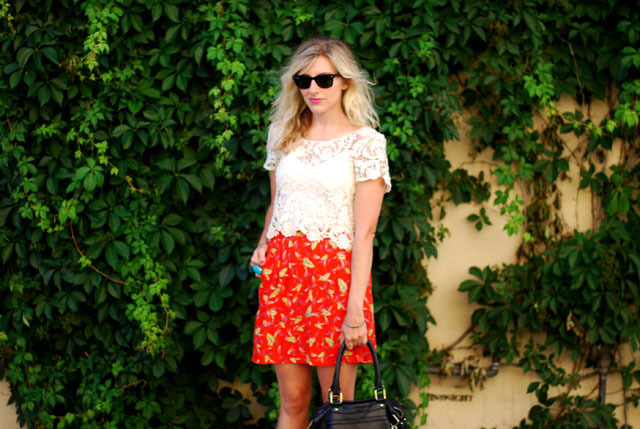 I can't get enough of the lace top or the color of the skirt! Summer brings the inner hippie in me out, too. that lace top is so perfect for summer! I love the mix of prints and textures here, and the bright, colorful accents. The little text on the wall behind you is so random, how delightful. You are so beautiful! I love the crochet lace look. Very sweet and summery. that cropped crochet is crazy! it's fab on you!!! im so craving for one! I love this look and the light and airy feel for summer! Cute! That is the perfect summer outfit. So summery and pretty! Love the skirt! I desperately need this skirt! Great summer outfit!!! Love the skirt! And the top is perfect with it. Great outfit! This looks cool and comfy, and so stylish! This is so so pretty, Taylor! I love that top! follow back if you'd like! I love the crochet top. i am planning to wear mine with a beige floral dress soon :) I also love the skirt, great color boost! the crochet number is beautiful! i love the colours in this outfit! the orangey red of the skirt looks great on you! Love your outfit. I too, love turquoise jewelry! My favorite. This is such a great combination. I love the pop of color from the skirt. It looks so chic but comfortable at the same time. What a beautiful top! I've been obsessed with lace recently. Such a nice outfit! The lace top is really gorgeous! You look pretty! Love the bright color of the skirt! you're so lucky! It's raining and freezing up here in Vancouver, BC. You look fantastic!! I'm the same way! When the southern summer heat and humidity come out, so do the easy breezy ensembles! each time you wear this hallelu top i find myself being more drawn to it. it's absolutely gorgeous and looks fantastic on you. huge fan of this outfit Taylor!!! so fun and summery. I love your lace blouse!!! super cute outfit. love love LOVE that lace on you! u will loove Jakarta if u came, lots of Sun in here hihihi. that lace top is so chic!